At the end of their six years with the Jesuits, each brother rejected the priesthood that we assume had been foreseen for them by their father, Carl. They were not cut out for the life, neither of them being a celibate type, as we shall see later. We shall see now what form that rejection took, firstly in the case of Karl Schubert. Before we can follow Karl to Vienna, however, we have to return briefly to Hohenseibersdorf, from where, in 1757 (it is said), a certain Andreas Becker had left for Vienna. (Note: if this date is correct, then this Becker is too old to be the Andreas Becker who allegedly taught the Schubert brothers their Latin. When this Andreas Becker left for Vienna, Karl was still a baby and Franz Theodor hadn't been born.) But at the time families propagated not only family names but first names, so it is not unusual to find another Andreas Becker in the same village. In Vienna, Andreas Becker the elder ended up as a teacher in an elementary school in the suburb of Leopoldstadt. We know not why or how. Shortly after that, on 11 September 1757, the 17 year-old Andreas married the daughter of the school principal, the 18 year-old Maria Anna Stadlbauer. Her father had died a short while before and, if we understand the events correctly, overnight Andreas went from the being an assistant teacher to being the new school teacher. The alert reader will have noticed that, according to the University of Vienna, Karl was enrolled in the year 1774-75, when, according to the records of the Jesuitengymnasium in Brünn, his final year didn't end there until 1775. Let's examine this apparent discrepancy a little later. Karl was in the middle of his first year at the university when Becker died on 4 August 1776 – whether suddenly or expectedly, we do not know. It may have been that Becker had been ailing and had called in his compatriot to help out with the school. Becker's call gave Karl the excuse he needed to avoid the draft into the priesthood. He had accommodation, a secure job and a widow! On Becker's death Karl took over his teaching. A short while later the 23 year-old Karl took over Becker's 39 year-old widow, marrying her on 15 February 1778. His ascent was as perpendicular as Becker's had been twenty years before: in under three years Karl had gone from teenage schoolboy to schoolteacher and effectively Principal. He had achieved, by being in the right place at the right time, just as Becker had been in his day, an outstanding jump onto the social ladder. The thought of Karl joining the priesthood was gone forever. 'It was managed by a job, and a good job, too'! At the time that Karl Schubert and Maria Anna Becker (née Stadlbauer) married in 1778, Franz Theodor was a 15-year-old in the middle of his final year at Brünn. In that autumn, following in his brother's footsteps, he came to Vienna and enrolled at the University. We are once more confronted with a discrepancy between the date Franz Theodor left school (1778) and the date he registered at the University of Vienna (1777). Even worse, according to the university records, Franz Theodor enrolled as a parvista, the first year of a gymnasium course for which he would be staying in the civis, the Stadtkonvikt, the equivalent of a hall of residence (the same institution his son would stay at during his schooling). That a graduate of the Jesuitengymnasium in Brünn should now register for the first year of a school course makes absolutely no sense at all and is clearly an error. The university also ran its own high school courses – in fact most of the enrolments at the university were for the high school, not the university courses – and parvista is the first year of the six year course (corresponding to the term used in Brünn: Rudimentorum). The immatriculation lists of the University of Vienna are notoriously inaccurate. Enrolments were scribbled on pieces of paper and transcribed into an annual list at the end of the year, giving plenty of scope for error. The disparity between the dates for the Brünn academic year and those for the university academic year arise from the absurd way the university recorded the immatriculation of its students. The year stated refers to the date when the immatriculation request was received. It is not necessarily the same as the year of the course that was actually followed. The university year began on 30 November with the election of a new Rector. If an immatriculation request was received before that date it was ascribed to the period of the outgoing Rector, even though the student's studies would start in the twelve months following 30 November, the term of the new Rector. In Franz Theodor's case he left Brünn in 1778, at the end of the academic year 1777-78. If he enrolled at the university before 30 November his immatriculation would be assigned to the current academic year, also 1777-78. His actual studies, though, would start in December 1778 and his first year of study would end in November 1779, that is 1778-79. Wasn't that interesting? Should you still be sceptical of this explanation, I could point out that it seems systemic and not just something to do with the Schuberts. For instance, we have already mentioned Karl Lengsfeld from Hohenseibersdorf, who went to the Jesuitengymnasium in Brünn a few years before Karl Schubert. He left Brünn in 1773 and registered at the University of Vienna. We observe the same discrepancy in the date of his immatriculation: 1772-73. It would, in fact, be quite reasonable to assume that the vast majority of students enrolled themselves before the academic year had started and were thus recorded a year 'early', that is, under the year before their studies actually began. This 'discrepancy' is the norm, in that case. in which a Franz Schubert registers for the academic year 1782-83, five years later than 'our' Franz Theodor. However, this 'Neudorf' is in Austriacus, meaning Austria, not in Moravus, Moravia. There are several Neudorfs in the empire. This one is in Austria itself. This Franz Schubert is not our Franz (Theodor) Schubert. Furthermore, logicus is a term used in the gymnasium for the second stage of the Trivium. Pauper indicates, as one might expect, that the student cannot afford to pay his fees. In short, none of this can apply to our Franz Theodor, who at least has the advantage of coming from the right village. Even the otherwise infallible Rita Steblin is led by this entry into believing that Franz Theodor attended the University of Vienna on two separate occasions. Unfortunately, this misinterpretion of an enrolment entry for the wrong Schubert has led a number of writers into bending the few other things we know about this complicated period in the brothers' lives to fit the 'fact' of an arrival in Vienna in 1783. Even at the simplest level of error, the dates in the University of Vienna's registers relate to the end of an academic year, meaning that this Schubert must have arrived in Vienna in 1782. But, since it's the wrong Schubert anyway, who cares? Why did both brothers sign up for a university course when they already had a teaching job? Just the first year of a university course brought a considerable status bonus. The university qualification was career-defining, giving them a higher status and allowing them to run their own schools. Franz Theodor moved to his own school in 1786. The Empress Maria Theresia's school reforms a few years before had instituted universal primary education. As is normal practice in dictatorships, this was done by fiat: the new schools and teachers would need to be provided very quickly. The Schubert brothers were now perfectly placed to ride this wave of rapid educational expansion. Franz started teaching in his brother's school and with that the two brothers were united again. Karl was Principal of a school and Franz was a teacher there. Confused? Me, too. Until our composer arrives on the scene there will be a lot more dates and some problems. The only solution is a timeline. This timeline tracks the progress of Karl Schubert and Franz Theodor Schubert from the moment that Karl leaves the Jesuitengymnasium to the moment Franz Theodor gets his own school. This period is not just confusing because of the paucity of information and the uncertainty of what little information we have but because Franz Theodor consistently misrepresents his age. He was six years old when he started his first year in Brünn – we expressed our astonishment when we first described this remarkable feat. After that he took a three year gap and returned for his second year a nine year old. When he completed the six year course at the Jesuitengymnasum he was fifteen. How was a clever fifteen year old to survive administratively in Vienna? He aged himself. 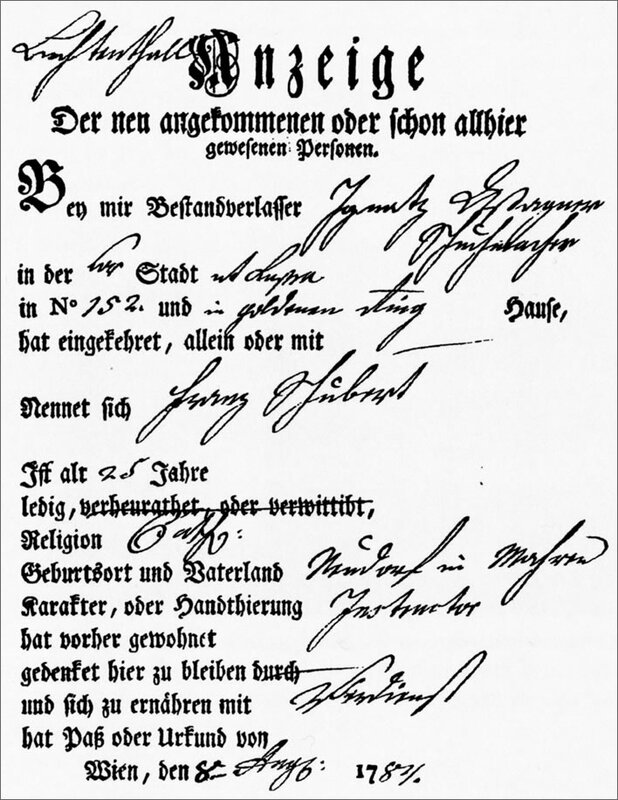 For a long time I doubted the record of Franz Theodor's baptismal date: was it really our Franz Theodor? Was the priest drunk? Are the pages in the parish register in the right order? If only he had been born three years earlier then all the other dates would have – sort of – come together. But there is no way round it. We have to accept that the date of his baptism really is as it is written in the parish register: 11 July 1763, without the trace of a doubt. Which in turn means that Franz Theodor was a child prodigy who spent half his life ageing himself prematurely. For this reason our timeline has two columns: one gives his chronological age, AgeC, and the other gives the ages that Franz Theodor declared on various official documents, AgeD. A third column, Diff, contains the difference between the two dates. The entries for Karl Schubert don't use these columns: Karl, whose education had been more othodox than his brother's, was eight years older than him and never had any need to age himself for administrative purposes. 1782 19 Meets Elisabeth Vietz before August. Carl and brothers start building the chapel in Neudorf. 1784 21 25 +4 Franz residence permit 08.08, 'Instruktor', '25y'. 1787 24 Carl dies in Neudorf 16.12. 1792 Maria Anna, Karl's wife and Becker's widow dies, 15.02. 1826 62 Franz Theodor becomes a citizen of Vienna 23.02. I am currently unsure about when the requirement for an obligatory period of teacher training took effect in practice and, if so, whether it applied to both Karl and Franz Theodor. The requirement for an obligatory one year training for teachers was introduced by Empress Maria Theresia in her school reform of 1774. I think that the year of study at the University of Vienna made this year unnecessary, but I have yet to prove this, but I am letting this entry stand until I know better. There are no records available for the teacher training course before 1784. If Franz's leaving age really was doctored it would have to have been done with the connivance of the teaching staff: Franz didn't write the class list. In which case we can also assume that that decision went to the top of the hierarchy. The school registers of the Jesuitengymnasium were inspected each year and no list writer would run such a risk without higher authority. In which case, too, it is also a measure of the esteem the staff had for Franz Theodor. Two and a half centuries after this list was written we can applaud the brazenness of '22' for the 15 year old! 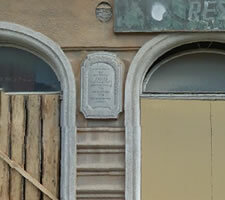 In his accreditation as Principal of his first school in Himmelpfortgrund Franz is said to have served five years as an assistant teacher, which would mean that that period started in 1781. Furthermore, the citation for the citizenship he received in 1826 notes that he has been active in the educational system for 45 years, which also confirms that he started his teaching career in 1781. However, if this is the case, why on several later occasions does he give his occupation as 'Instruktor' and, on the residence permit, his source of income as 'earnings'? Elisabeth and Magdalena Vietz were two sisters. Elisabeth married Franz and Magdalena (eventually) married Karl, providing us with a pleasing symmetry. We discuss them later. Franz (just not cut out for the celibate life) made a baby with Elisabeth sometime around August 1782. The baby, Franz Ignaz Vietz, was born out of wedlock on 12 April. We presume his father was Franz Theodor, although there are wilder speculations for those who prefer such things. More on him later. We know that Franz wrote to the parish of Hohenseibersdorf requesting a copy of his baptismal entry. We can only suppose that this was required in connection with his wedding. If so, this would not necessarily have been in Franz Theodor's favour: it would certainly have contradicted his inflated age and thus would have been unhelpful to him. At the time of making the request Franz Theodor's age was 20. Had either of the pair been under 21 that person would have been required to produced the written permission of a parent. At the time of the wedding Franz Theodor was still 21. We have no record whether his father Carl approved of the marriage or not, or even whether he was asked or even knew about it. Franz moves to the accommodation goldener Ring in August, Elisabeth moves in a month later. Franz Theodor and Elisabeth Vietz marry. Not a moment too soon, since Elizabeth was seven months pregnant with their first 'official' child, Ignaz Franz, who would be born scarcely two months after the wedding on 8 March. Somehow the concubinage and the creation of an illegitimate child turned into a 'model of good morals' when Franz Theodor got the job at the Himmelpfortgrund school. I don't know what age he pretended to be on that occasion. Now it is Karl's turn to make a baby with Elisabeth's sister Magdalena sometime around January 1787. The baby, Franz Vietz, was born out of wedlock on 2 October and died a little over two weeks later, on 18 October. We presume his father was Karl. Maria Anna Stadlbauer/Becker/Schubert, Becker's widow, the marriage to whom had so transformed Karl's fortunes, died aged 53. The bed had no more than three months to cool down before Elisabeth's sister Magdalena (28) slipped into it alongside the 37 year old Karl. The couple would have 12 years of married bliss ahead of them: let the procreation begin! Franz doesn't hang around either: after the death of Elisabeth a replacement was found before the year was out. This time his age is given correctly on the marriage certificate. Franz has become an impressive and admired schoolmaster, who has brought his school to the top of the league in Vienna. His colleagues begin a petition for the award of an honour to him, but they, too, get confused about his age. Perhaps, after years of drudgery in the Austrian school system, he just looked four years older than he was. The award came too late. Franz Theodor Schubert's residence permit for the Haus zum goldenen Ring in 1784. ^ Denk, Ulrike et al. Die Matrikel der Universität Wien. VIII. Band 1746/47–1777/78. Graz [u.a. ]: Böhlau, 2014. 'Schubert': p. 548. ^ Quoted in Steblin, Rita. 'Franz Schubert - das 13. Kind', Wiener Geschichtsblätter, Wien, vol. 55-56 (2000-2001), p. 245-265. p. 252.